Chabad Represntatives at the funeral of Yocheved Orpaz Crowds gathered at the Yarkon Cemetery for the funeral of Yocheved Orpaz‚ May G‑d avenge her blood‚ who was murdered in the Chabad House in Mumbai. Alongside family and friends‚ a Chabad delegation gave condolences in the name of the Chabad movement. 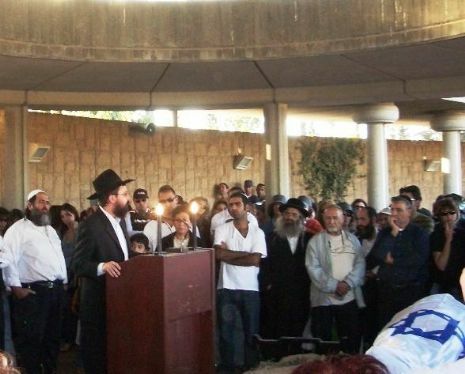 Crowds gathered at the Yarkon Cemetery for the funeral of Yocheved Orpaz, May G‑d avenge her blood, who was murdered in the Chabad House in Mumbai. Alongside family and friends, a Chabad delegation gave condolences in the name of the Chabad movement. Avi, Yocheved’s son, took leave of his mother on her final journey, wearing a blue kippah with the lettering “Chabad House - Mumbai”. Avi related to Rabbi Menachem Kutner, of Chabad’s Terror Victims Project, that he found the kippa in a bag belonging to his mother, which arrived with her body from India. Scores of people gathered at the Yarkon cemetery to accompany Yocheved on her final journey. Those gathered were emotionally moved from the eulogies delivered by the family, especially from her grandchildren who were painfully separated from their beloved grandmother. The deputy foreign minister, Mr. Magli Ouaba, represented the government of Israel. “At this difficult time, it is hard to speak, the heart refuses to digest the news, the mind asks questions, but they remain unanswered. Yet, at the same time, we have great faith, and we will continue to bring light to the world. “In the name of Chabad, I’d like to extend to you, the Orpaz family, a loving and embracing hand. I sat in your home and heard much about your mother, and her wonderfully good deeds. Now it rests upon you to continue in her ways for the merit of her soul. “Yocheved was staying at the Chabad House where she experienced their warm hospitality and Ahavat Yisroel, love for a fellow Jew. Yocheved was murdered in the Chabad House, her blood spilled with the blood of the Shluchim, Chabad’s emissaries. We are all now a family of one. A family of Chabad"